Atop the old Chinese Wall on the Donner Pass Summit Tunnel Hike, I’m holding a Warrior II yoga pose. On the other side of the wall, a ground squirrel watches me suspiciously. Donner Lake is abuzz with boats touring the lake beneath a gentle blue sky dotted with fluffy clouds. Having completed the first half of the hike, 3.69 miles from trail start to the end of the Chinese Wall, I’m about 7,000 feet up in elevation, and loving the views. This is such a great spot to relax and contemplate life before the return hike back to the truck. 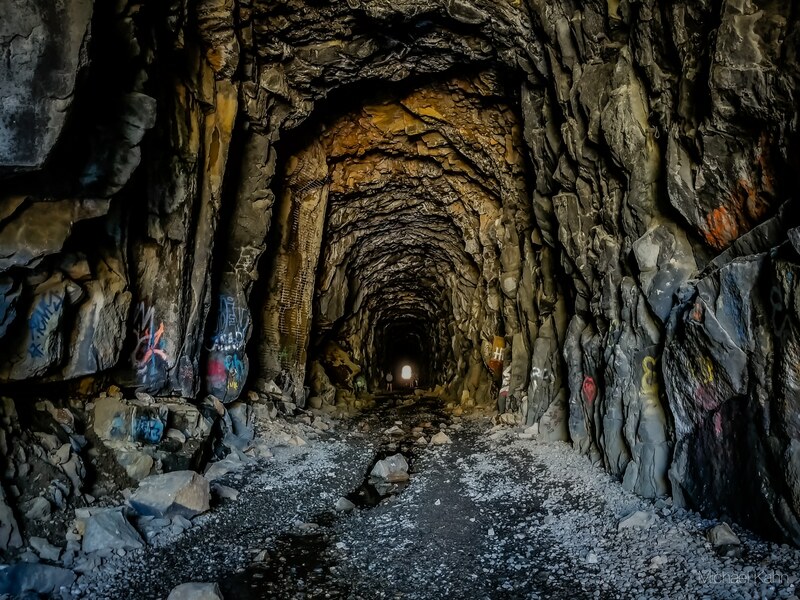 The Donner Pass Summit Tunnel is a 7.4 mile hike, out and back, taking you along the old railroad tunnel built by Central Pacific Railroad. Through a series of four tunnels, several miles of snow sheds, and a “Chinese Wall”, this hike takes you along the 1868 route of railroad transport. Throughout the hike, you will find yourself greeted by scenic views of Donner Lake and a look into Nor Cal and Bay Area graffiti subculture. From political messages to tags, miles of art will keep you intrigued and entertained. Overall, the hike is pretty easy on flat gravel, with the tracks long removed. At the time of my hike, there was a a mud slide or avalanche from the snow which led to the last third of the trail being a bit more difficult to reach. I have doubts it will be repaired at this point. In fact, this entire area near Sugar Bowl is infamous for deadly avalanches – tread carefully should you choose to explore in the wintertime. A flashlight or headlamp is highly recommended. I use a 320 lumen flashlight which lit up the tunnels very nicely and provided great visibility for both the tunnel walls and ground for walking and not tripping. After seeing what other people were using, a flashlight felt like a superior choice – especially a high powered one like mine. Headlamps didn’t light up nearly enough and many of the normal flashlights felt dim in the expansive tunnels. You could make the hike without extra light, but sections might be a bit hairy – there wasn’t total darkness anywhere. Turning off Sugar Bowl Road takes you through a short, windy dirt road to a parking lot with ample parking. From the parking lot, you can follow a small dirt trail up to a placard about the area, or immediately start the hike by heading under the road. Beyond the ominous gate, begin your trek into a world from a past era. The beginning leg of the hike is a mere warmup with small tastes of the expansive railroad tunnels. Looking up reveals old infrastructure and wood framing centuries old. Without any knowledge of tunnel building, it was fun to try and imagine what the different aspects of the tunnel were used for. Water slowly drips down from the ceiling, forming a puddle in the center, and sometimes falling on my head for a rude awakening. At a few points in the tunnel entrances, there were bats nestled away in the upper crevices. I couldn’t find too much guano on the ground. Beyond the first tunnel was a reprieve which led to the initial views of Donner Lake, far into the distance. Beyond trees and with a bit of squinting, I could see the tunnels winding and stretching around distance mountains. It felt much further. During some quick exploration, I found a mound of snow ripe begging to be made into snowballs. I tried to nail my photographer, but am a terrible shot. Venturing into the next tunnel, I found a ladder leading to some electrical stuff. Cue finger point and disapproving look: Do as I say, not as I do. Don’t do this. Incredibly dangerous. I am merely showing what not to do. Finally, with the shorter tunnels out of the way, it was time to enter a much more ominous looking tunnel. This was the location of the first Chinese Wall, butted up directly to the mountain. The lighting throughout was delightfully creepy. The way the sun shone through the small ventilation windows and graffiti reflected in the pools of water was a sight to behold. At a couple spots, doorways led to the outside. Peeking out one gave a preview of the tunnel stretching around the next mountain curve, as well as Donner Lake, much closer now. Heading back into the tunnel and continuing the hike, echoing footsteps took me further into the den of artistry and historic significance. There are some truly amazing artists which have graced these tunnels. This was quite the art gallery. Exiting this tunnel, I came upon a mudslide or avalanche area which required some careful footwork to get through. I noticed a lot of people seemed to be turning around here, and for good reason. It was a pretty steep drop and the ground was slippery with the mountain sand. Getting past the obstacle and onto the next tunnel, I ran into a pair of graffiti artists making their mark. Beyond the artists, even more exceptional work was to be found. It seemed like the quality of art increased once I travelled past the beginning portion of the hike. There is so much I want to share with you, but some of it is worth not displaying here and letting you hike these tunnels and find the art which speaks to you on your own! Finally, light again! The end of the tunnels! The second Chinese Wall greeted my eyes with continued breathtaking views of the valley and lake below. It didn’t take long to scale the wall and lay down atop it, head tilted to the side to watch the trees sway in a light breeze and feel the sun on my face. From here, its a fun walk back to the start. On the return leg of the hike, I decided to take some video to show what the Donner Pass tunnels sound and feel like. Well, kind of feel. Don’t get fingerprints on your screen! Parts of the tunnel had a lot of snow on top and it was melting fast in the hot July weather. This video shows a portion of the hike where it almost felt like rain. Between the natural beauty and the man-made beauty, this looks like a perfect hike! And your photos are gorgeous. Thanks for sharing! Mike, I love this adventure post! I never knew there was a tunnel to explore at Donner Pass. Your videos are fabulous. I feel like I’m right there seeing a bat, viewing the beautiful graffiti, and walking along that rugged path within the tunnel. Your adventures inspire me to get outside, drive somewhere new, explore the area and find hidden gems like this. Basically, your blog is a roadmap to adventure! Thanks for taking me along for the ride.